TDmonthly Magazine Products by PUZZLED, INC. Kids can learn about colors, numbers, stacking and nesting with this set of wooden nesting boxes. 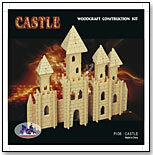 This puzzle kit comes complete with everything you need to build your own castle. The designs are already on the puzzle pieces and kids just need to pop them out and begin constructing.